It’s been 4 years since we’ve seen a new Jansch album, during this time the passing of many re-issues and re-compilations have cluttered the shelves. 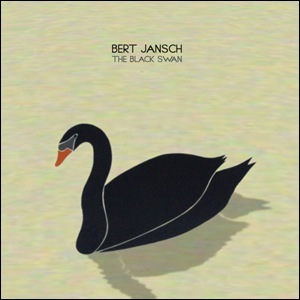 The Black Swan is an album that shows that time truly ferments the adroitness that Jansch wields with his guitar and voice, both mature and elegiac. The Black Swan with its soft rhythm and tightly arranged strings seems to hold a mystique, possibly mournful? When The Sun Comes Up featuring the voice of Beth Orton, soft but aromatic, holds a nice bluesy feel to it while Katie Cruel is a true gem, with Devendra Banhart taking it one step further. From a possible political point Texas Cowboy Blues to uniquely arranged traditional songs like The Old Triangle the Black Swan radiates colour. Other featured artists also include Kevin Barker and Paul Wassif. The basic tracking was recorded at Jansch’s home studio in London while over dubbing and production was overseen by Noah Georgeson in LA. Jansch seems to know what he wants, a clear picture and armed with the array of featured artists this album will stand the test of time.